Very important remark: If you need the Spare parts Catalog please inform engine model and engine configuration. Any additional information (Serial Number, Equipment where the engine is installed etc.) will be helpful. See the engine plate at the foot of this page. 244010 D 404 LIEBHERR Diesel Engine D404 Spare parts catalog. Workshop Manual. 244015 D 405 LIEBHERR Diesel Engine D405 Spare parts catalog. Workshop Manual. 244020 D 504 LIEBHERR Diesel Engine D504 NA, D504 T, D504 TI Spare parts catalog. Workshop Manual Base Engine. Workshop Manual Mechanical Fuel Systems. D504 TI Workshop Manual Electronic Fuel System. D504 TI Workshop Manual Electronic Fuel System with Denos HPCR. Additional important Service Informations. 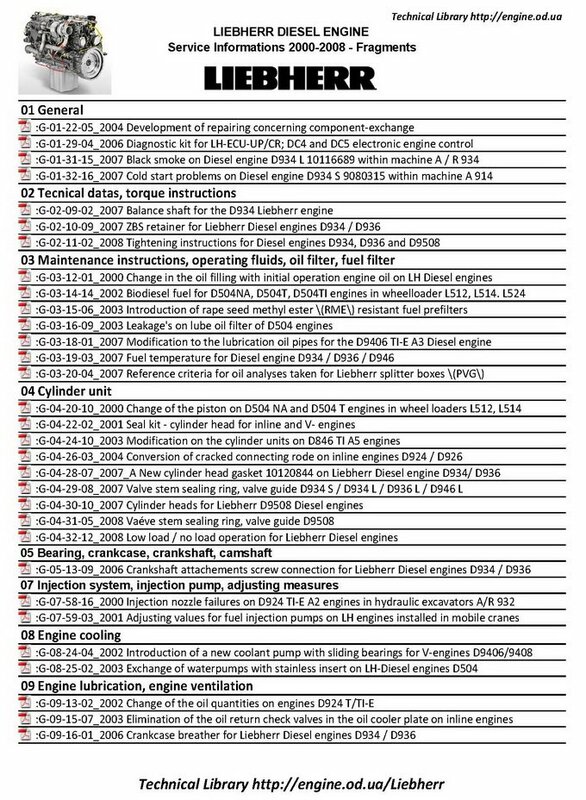 244025 D 836 LIEBHERR Diesel Engine D836 Operator's Manual. Additional important Service Informations. 244030 D 846 LIEBHERR Diesel Engine D846 Spare parts catalog. Service (Workshop) Manual. Operator's Manual. Additional important Service Informations. 244035 D 846 TI LIEBHERR Diesel Engine D846TI Spare parts catalog. Service (Workshop) Manual. Operator's Manual. Additional important Service Informations. 244040 D 904 LIEBHERR Diesel Engine D904 Spare parts catalog. Service (Workshop) Manual. Additional important Service Informations. 244045 D 904 NA LIEBHERR Diesel Engine D904NA Spare parts catalog. Service (Workshop) Manual. Additional important Service Informations. 244050 D 904 TB LIEBHERR Diesel Engine D904TB Spare parts catalog. Service (Workshop) Manual. Additional important Service Informations. 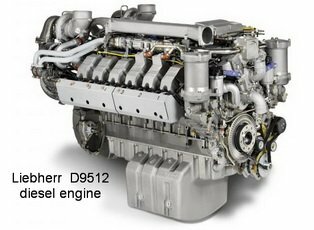 244055 D 906 LIEBHERR Diesel Engine D906 Spare parts catalog. Service (Workshop) Manual. Additional important Service Informations. 244060 D 906 NA LIEBHERR Diesel Engine D906NA Spare parts catalog. Service (Workshop) Manual. Additional important Service Informations. 244065 D 906 TB LIEBHERR Diesel Engine D906TB Spare parts catalog. Service (Workshop) Manual. Additional important Service Informations. 244070 D 914 LIEBHERR Diesel Engine D914 Spare parts catalog. Service (Workshop) Manual. Additional important Service Informations. 244075 D 914 T LIEBHERR Diesel Engine D914T Spare parts catalog. Service (Workshop) Manual. Additional important Service Informations. 244080 D 914 TI LIEBHERR Diesel Engine D914TI Spare parts catalog. Service (Workshop) Manual. Additional important Service Informations. 244085 D 916 LIEBHERR Diesel Engine D916 Spare parts catalog. Service (Workshop) Manual. Additional important Service Informations. 244090 D 916 T LIEBHERR Diesel Engine D916TI Spare parts catalog. Service (Workshop) Manual. Additional important Service Informations. 244095 D916TI LIEBHERR Diesel EngineD916T Spare parts catalog. Service(Workshop) Manual. Additional important Service Informations. 244100 D 924 LIEBHERR Diesel Engine D924 Spare parts catalog. Service(Workshop) Manual. Operator's Manual. Additional important Service Informations. 244105 D 924 T-E LIEBHERR Diesel Engine D924T-E Spare parts catalog. Service (Workshop) Manual. Additional important Service Informations. 244110 D 924 TI LIEBHERR Diesel Engine D924TI Spare parts catalog. Service (Workshop) Manual. Additional important Service Informations. 244115 D 924 TI-E LIEBHERR Diesel Engine D924TI-E Spare parts catalog. Service (Workshop) Manual. Additional important Service Informations. 244120 D 924 TI-EA4 LIEBHERR Diesel Engine D924TI-EA4 Spare parts catalog. Service(Workshop) Manual. Additional important Service Informations. 244125 D 926 LIEBHERR Diesel Engine D926 Spare parts catalog. Service (Workshop) Manual. Operator's Manual. Additional important Service Informations. 244130 D 926 T-E LIEBHERR Diesel Engine D926T-E Spare parts catalog. Service (Workshop) Manual. Additional important Service Informations. 244135 D 926 TI LIEBHERR Diesel Engine D926TI Spare parts catalog. Service (Workshop) Manual. Additional important Service Informations. 244140 D 926 TI-E LIEBHERR Diesel Engine D926TI-E Spare parts catalog. Service(Workshop) Manual. Additional important Service Informations. 244145 D 926 TI-EA4 LIEBHERR Diesel Engine D926TI-EA4 Spare parts catalog. Service (Workshop) Manual. Additional important Service Informations. 244150 D 9306 T LIEBHERR Diesel Engine D9306T Spare parts catalog. Service(Workshop) Manual. Additional important Service Informations. 244155 D 9306 TB LIEBHERR Diesel Engine D9306TB Spare parts catalog. Service(Workshop) Manual. Additional important Service Informations. 244160 D 9306 TI LIEBHERR Diesel Engine D9306TI Spare parts catalog. Service(Workshop) Manual. Additional important Service Informations. 244165 D 9308 T LIEBHERR Diesel Engine D9308T Spare parts catalog. Service (Workshop) Manual. Additional important Service Informations. 244170 D 9308 TI LIEBHERR Diesel Engine D9308TI Spare parts catalog. Service (Workshop) Manual. Additional important Service Informations. 244175 D 934 LIEBHERR Diesel Engine D934 Operator's Manual. Service (Workshop) Manual. Instruction for Troubleshooting and Rectifying Faults. Additional important Service Informations. 244180 D 934 A6 LIEBHERR Diesel Engine D934 A6 Spare parts catalog. Service (Workshop) Manual. Instruction for Troubleshooting and Rectifying Faults. Additional important Service Informations. 244185 D 934 S/L LIEBHERR Diesel Engine D934 S/L Spare parts catalog. Service (Workshop) Manual. Additional important Service Informations. 244190 D 936 LIEBHERR Diesel Engine D936 Operator's Manual. Instruction for Troubleshooting and Rectifying Faults. Additional important Service Informations. 244195 D 936 A6 LIEBHERR Diesel Engine D936 A6 Spare parts catalog. Service (Workshop) Manual. Instruction for Troubleshooting and Rectifying Faults. Additional important Service Informations. 244200 D 936 L LIEBHERR Diesel Engine D936 L Spare parts catalog. Service (Workshop) Manual. Additional important Service Informations. 244205 D 9406 LIEBHERR Diesel Engine D9406 Spare parts catalog. Service (Workshop) Manual. Additional important Service Informations. 244210 D 9406 T LIEBHERR Diesel Engine D9406T Spare parts catalog. Service (Workshop) Manual. Additional important Service Informations. 244215 D 9406 TI LIEBHERR Diesel Engine D9406TI Spare parts catalog. Service(Workshop) Manual. Additional important Service Informations. 244220 D 9406 TI-E LIEBHERR Diesel Engine D9406TI-E Spare parts catalog. Service (Workshop) Manual. Additional important Service Informations. 244225 D 9408 T LIEBHERR Diesel Engine D9408T Spare parts catalog. Service (Workshop) Manual. Additional important Service Informations. 244230 D 9408 TI LIEBHERR Diesel Engine D9408TI Spare parts catalog. Service(Workshop) Manual. Additional important Service Informations. 244235 D 9408 TI-E LIEBHERR Diesel Engine D9408TI-E Spare parts catalog. Service (Workshop) Manual. Additional important Service Informations. 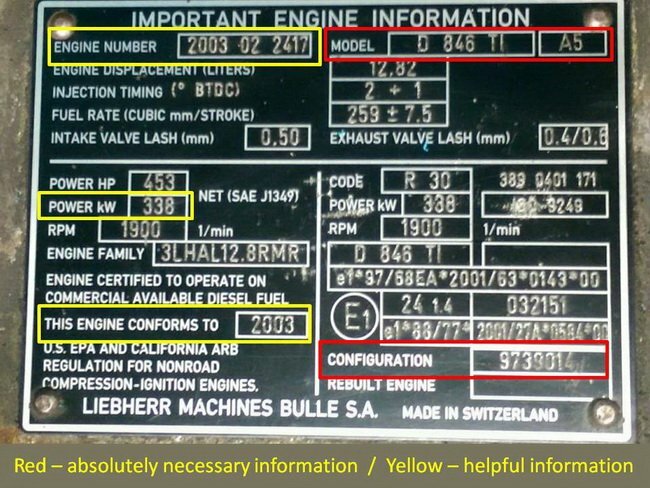 244240 D 9508 LIEBHERR Diesel Engine D9508 Operator's Manual. Additional important Service Informations. 244245 D 9508 A7 LIEBHERR Diesel Engine D9508 A7 Spare parts catalog. Service (Workshop) Manual. Additional important Service Informations. 244250 D 9512 A7 LIEBHERR Diesel Engine D9512 A7 Spare parts catalog. Service (Workshop) Manual. Additional important Service Informations. Video presentation LIEBHERR PDF Workshop & Operation Manuals, and Spare parts Catalog.